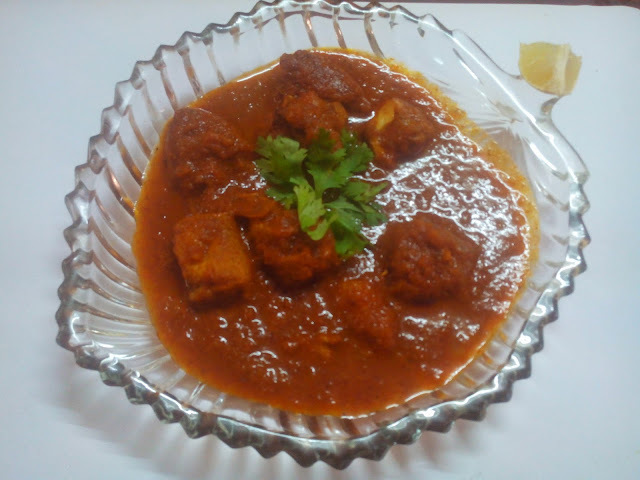 Chicken rogan josh is a kashmiri dish which is sure to impress all your guests when made at a dinner party. Put the oil into a pan on high heat. While the onions are cooking, mix together the Ginger garlic paste, Chilli Powder, Curry Powder, Turmeric and a little water to make a paste. Once the onions have gone a golden color, add the paste and fry for a couple of minutes while stirring well. Add the chicken to the pan and stir for a minute or so until the meat has been sealed on all sides. De-seed the tomato quarters and add to the pan. Finally, add the Onion Puree, Tomato Puree, Chopped Tomatoes, Yoghurt and Chicken Stock to the pan and stir in well. Bring to the boil and reduce down to a low heat to simmer for 15 minutes, stirring every 3-4 minutes. Have a taste of the sauce at this point and season with salt to taste if necessary. Add the Garam Masala and mix in well and cook for a further 2 minutes. Serve with Rice or Naan and Garnish with Coriander.